The research highlighted that electricity network companies in Scotland are lagging behind other DNOs in relation to support for vulnerable consumers. 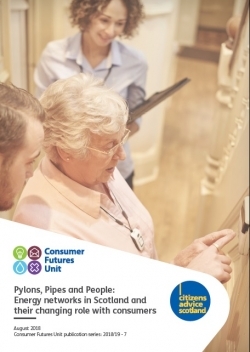 Scottish DNOs should invest further and increase the reach of programmes for vulnerable consumers across all of Scotland, supported by the appropriate organisations and Ofgem. Confidence was found to be falling in the RIIO -ED1 Stakeholder Engagement and Customer Vulnerability (SECV) incentive scheme. Ofgem should take steps, such as improving the consistency in its approach to assessment and providing feedback, to re-establish confidence in the SECV assessment process. A forward thinking approach with the appropriate support for consumers is needed to ensure that no one in Scotland gets left behind in the transition to a smarter electricity network. Whole system planning is necessary to ensure that electricity networks are integrated within local heat and energy efficiency strategies in Scotland. Scottish specific circumstances need to be reflected in GB wide policy development and regulatory programmes such as RIIO. Consumer protections, such as appropriate redress and complaint handling, for vulnerable consumers within community energy projects and new flexibility services must be prioritised. An open consumer-orientated policy debate on the future of the Fuel Poverty Network Extension Programme in Scotland is needed –and fuel poor consumers who are off the gas grid must be given priority support while decisions are made. This could be targeted at fuel poor electric heating customers as a priority. Our report ‘Pylons Pipes and People’ along with a briefing sheet are available for download below.